Readers talk about the problem with lab animals and an important warning about heart disease. “Will Animals Ever Leave the Lab?” (Winter 2008) suggests that such organisms as zebrafish and fruit flies might replace the use of higher-order lab animals in predicting human responses to drugs. In fact, in many instances, another experimental system has greater value than animals: human cells and tissues. The pharmaceutical industry has experienced countless examples of the deficiencies of laboratory animals as human surrogates. Given that the drug candidates selected for clinical trials have been thoroughly evaluated beforehand in multiple nonhuman species, clinical trial failures clearly demonstrate that animal results do not always predict human effects. The two major reasons for these failures are efficacy and toxicity. Species can differ significantly in their biochemical pathways for metabolism and their targets for toxic responses. So, a drug that is efficacious in mice, rats, dogs and sometimes even monkeys still might not be efficacious in humans. Similarly, a drug that is nontoxic to animals might be extremely toxic to humans. Consider the environmental toxin TCDD-dioxin: Its LD-50 (dose to kill 50% of the animals tested) is about 1 microgram per kilogram for guinea pigs but 1,000 micrograms per kilogram for hamsters—thousandfold difference for two animals that look alike. If the phenomenon being studied is indeed specific to humans, animals should not be used, period. In these cases human tissues are the only valid experimental tools besides human trial subjects. And tissues are being used: To evaluate drug-drug interactions, the FDA now requires testing in human liver cells or tissue fractions in vitro rather than in lab animals. Soon, human cells and tissues will also likely have significant impact on pharmacological and toxicological testing. At minimum, human in vitro experimental systems can be used to aid selection of the most relevant animal species in the laboratory to advance our understanding of human biology. Albert P. Li // Founder and CEO, Advanced Pharmaceutical Sciences Inc., In Vitro ADMET Laboratories LLC, Columbia, Md. 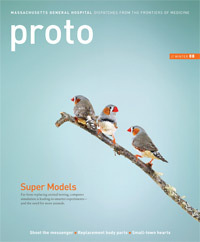 Your Winter 2008 issue is superior, cover to cover. What especially grabbed my attention was your reference, in “One Town's Treasure,” to the 1998 Framingham Heart Study report that provided "a formula for predicting, based on risk factors, a person's chance of developing heart disease within a decade." Although our central interest is the prostate, most of our members also have heart problems. I think we would be remiss if we failed to alert members to the risk factors in the Framingham report. I will alert our members to those factors in our newsletters from here on out. Claude Gerard // Chair, American Prostate Society, Hanover, Md.